Instead of the usual cute-happy-pink-red type valentine, this one is more about unrequited love and rejection, which pretty much sums up Yamada (left) and Mayama's (right) relationship. They're turned away from each other, and the heart part of the clover is upside-down to signify the unrequited love, but their clothing colours being reversed signified that they still have a connection to each other and can't let go. And originally, I had the clover kinda hanging from the top, as a kind of parody of the tradition of hanging mistletoe :D But it looked weird so I took it out. that is what i see when yamada and mayama are together. 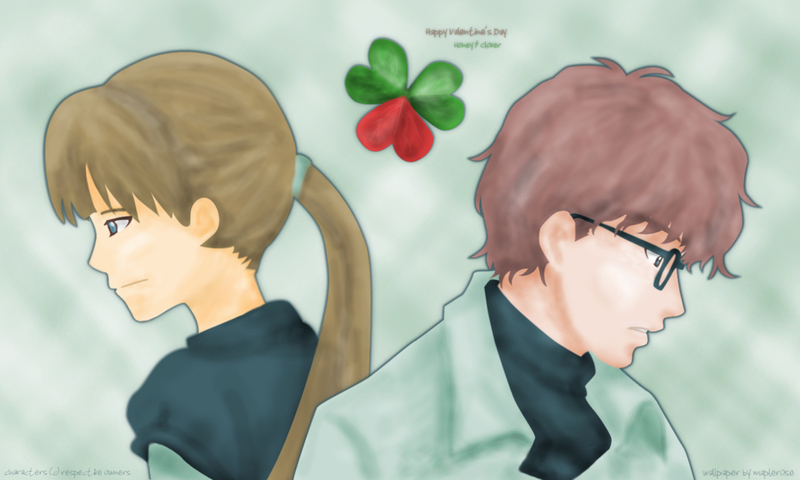 thanks very nice image love Honey & Clover!